Wash squash, split in half lengthways and rub the inside with a little salt, pepper and 1 tbsp olive oil. Line a pan with parchment paper and place the squash cut side down. Roast for about 20-30 minutes. The skin will be starting to brown and the flesh will be easily pierced all the way through with a fork. Remove from oven and keep warm. While squash is roasting, prepare the sauce: Heat the remaining 2 tbsp olive oil in a large frying pan over medium heat. Add carrot, leek, celery, TVP (or cooked beef) and garlic. Sweat until the leek starts to become translucent. Add green pepper and mushrooms. Turn heat to high and cook until pan starts to sizzle loudly; deglaze with wine. Once wine is nearly evaporated, add the whole can of tomatoes (including juice). Reduce the heat to low and simmer for 15 minutes. Season to taste with salt and pepper. 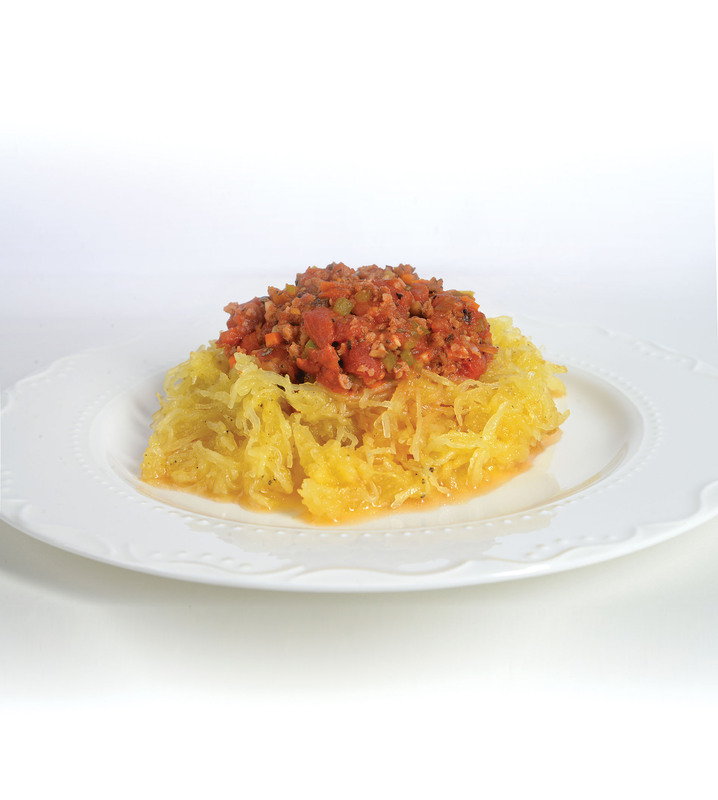 While sauce is simmering, prepare your â��spaghetti.â�� Using a fork, start scraping out the inside of the roasted squash. It will come apart in long strands. Place a serving of squash on a plate and top with tomato sauce.